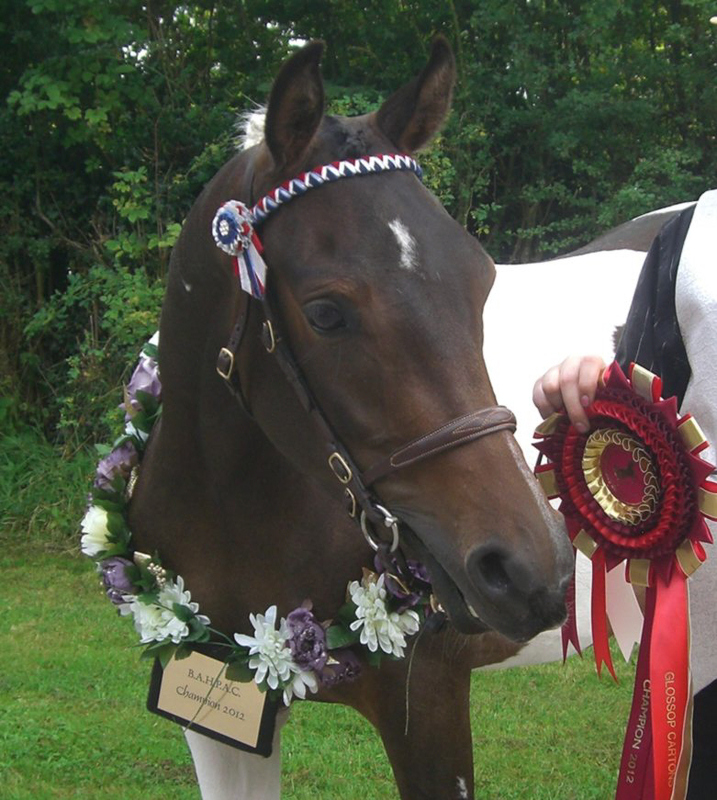 Terackie Colour By Design reserve champion ridden coloured Cardigan show 2014 first ridden show. Terackie Psynsatonal Design pintabian colt carrying 99.9% arab blood. 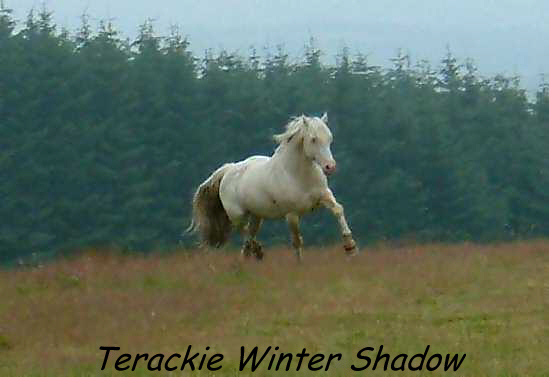 Welcome to Terackie Stud of Palomino Welsh Ponies and Cobs. 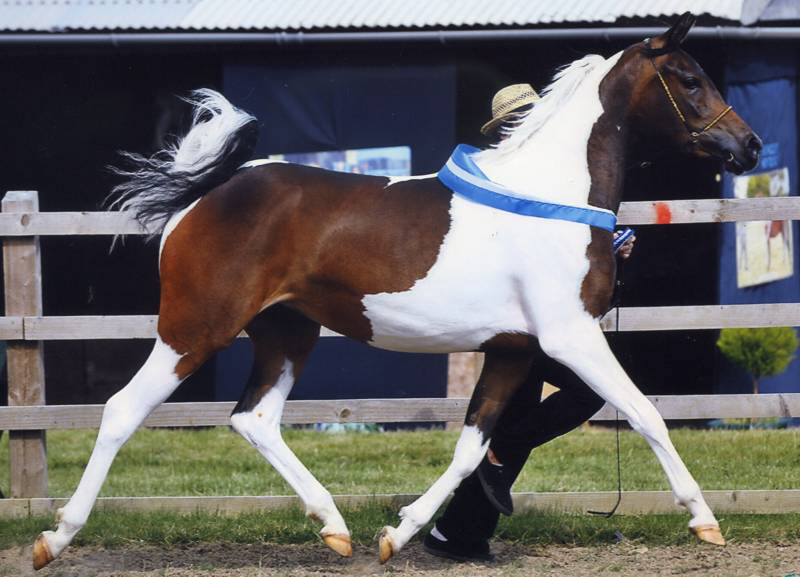 We are also very proud to be the first importers and now breeders of Pintabians, please go to the Pintabians page to find out more about these beautiful tobiano arabian horses. Frosty was sire to many of our Section A foals but has since been gelded, now broken to ride and drive, see his page for photos and info on him. 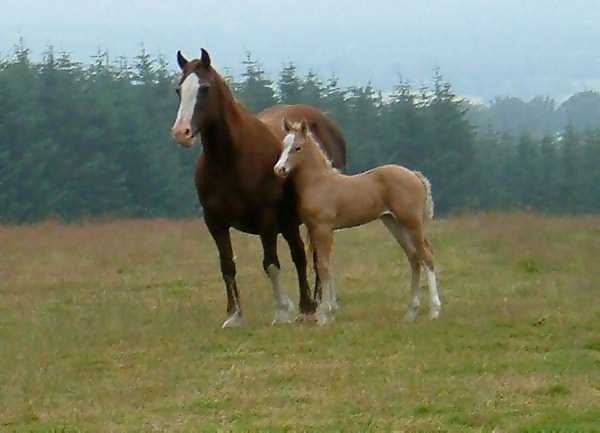 Welcome to Terackie Stud of Palomino welsh Ponies and Cobs. 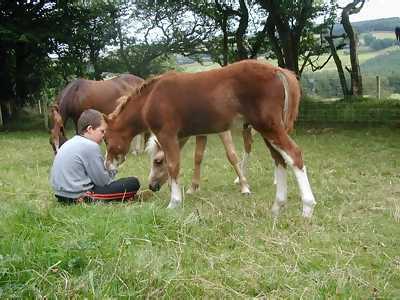 We are a small family run stud in Tregaron, WALES, the heart of old cob land, we strive to breed quality typey section D Cobs and section C ponies of cob type in the beautiful colour of PALOMINO. We were established in 1991 when we purchased our section D foundation mare Blaenteifi Myfanwy who was by Ffoslas Dafydd 25721 and out of Blaenteifi Megan by Ffoslas Caradog Ap Dafydd. Myfanwy was a very Welsh Sec D mare, with bone and feather full of character and presence, cheeky and moody at times but then she was a chestnut mare. We bought her in foal to the sup.ch Horeb Euros 27999 and she duly produced a cracking black filly foal Terackie Midnight Star, they were shown with some success and the filly as a yearling but she did not really have what we would have liked for our breeding purposes, so she was broken to ride and went on to be a wonderful childs riding pony. Myfanwy had a selection of smart foals to various stallions over the next few years, but my heart was always with the palomino colour and a palomino Sec. D stallion could not be found around here. 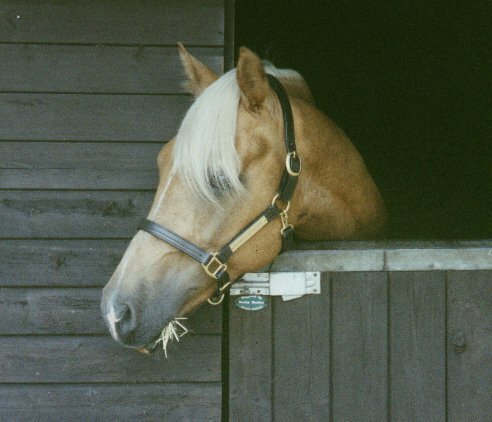 When we started our stud the palomino coloured welsh cob was fairly rare, it wasn't a very popular colour and few were seen for sale but it was still my dream to breed palominos. My search for a good quality mare or filly went far and wide and was un-successful, eventually having trawelled through countless old cob sale catalogues I found the Deicin Stud, near Aberaeron, who occasionally got palomino foals from a chestnut X dun mating, I phoned and spoke to Barry Owen who said he had a palomino colt foal, we went for a look but with no real intention of buying a colt, when we saw the quality, temperament, size and action in the colt we bought him there and then, never having owned a stallion before we were warned to be careful, but the colt didn't have a mean bone in his body. In the October of 1994 we went and collected our new colt Deicin True Briton, who had already been named "Orbit" by our 3 year old son Ben. When Orbit was just a novice 2 year old we covered Myfanwy with him, although we had already decided to sell her on without waiting to see the foal (Big mistake!!) she was purchased by Su and Henry Aburrow of the Clements Stud, the following year she produced an outstanding palomino colt who was named Clements Midas, see photo of him below. He has been shown with much success and is now standing at their stud. In May of 1995 we found the super mare Aberlogin Polly we purchased her and there the start of our palomino breeding really began. She was covered by Nebo Thomas and the following year produced Terackie Koudos. Seen below as a 4 year old. He has been a multi champion in hand winner for his owner Di Wood. In 1996 we covered Polly with Orbit and she had the cremello colt Terackie Winter Shadow, who has now taken over his fathers place as stud stallion. He has proved to be a fabulous stock getter for us and now covers most of our section D mares, he is leaving us some stunning palomino foals. From Blaenteifi Myfanwy X Nebo Daniel we bred Terackie Madam Xantia in 1993, a lovely liver chestnut mare, Xantia was first covered by Terackie Winter Shadow in 1999 and produced a stunning palomino colt, namely Terackie Golden Charm who is now being shown at County level under saddle and doing extremely well. Xantia has been covered by Winter ever since and has produced a succession of quality palomino foals including T.Golden Xara, T.Xacaria and T. Xanthe exported to Germany. 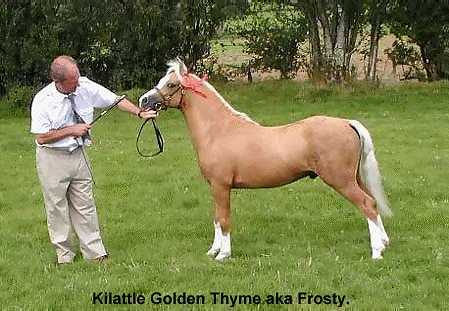 In 2000 we purchased the smart Section A palomino colt foal Kilattle Golden Thyme otherwise known as Frosty from The Kilattle Stud in Yorkshire. 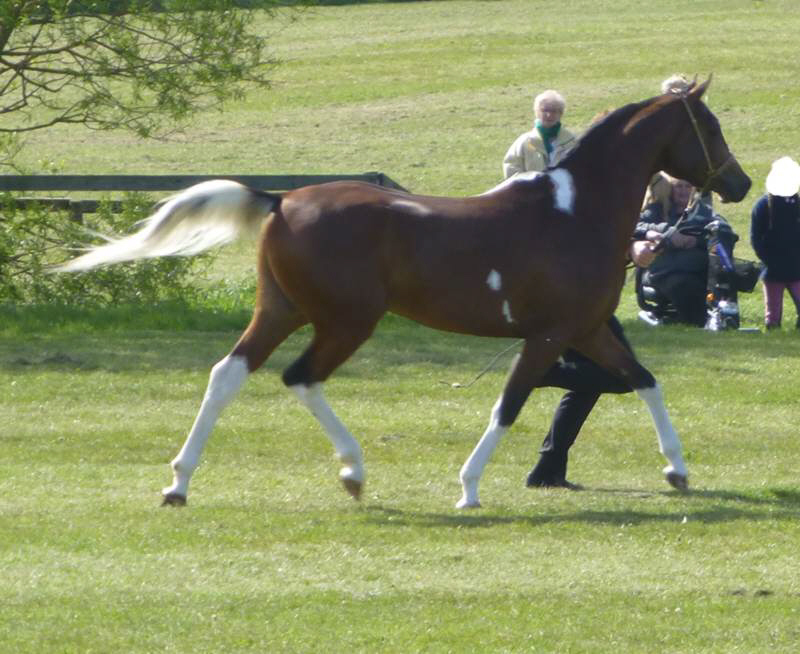 It was intended for him to be shown, then licenced and used as our foundation stud stallion. Frosty is by Nantlais Guto and out of Sanclere Morwena by Blackhill Jamie. Seen in the photo at the top of this page being shown as a two year old, he has exhibited a wonderful kind temperament combined with his excellent confirmation and colour. We are very proud to own him. 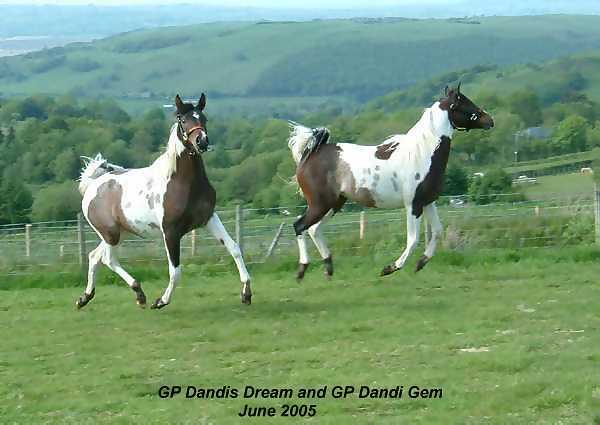 Frosty has produced some stunning foals in the last couple of years but the decision to geld him had been made and in April 2005 he was gelded. Now a real sweetie for the kids to ride and broken to drive with full concentration on his behalf! 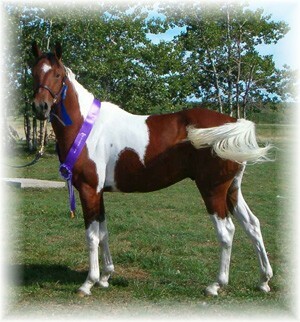 In 2006 we discoverd the beautiful breed of pinto arabians known as Pintabians. 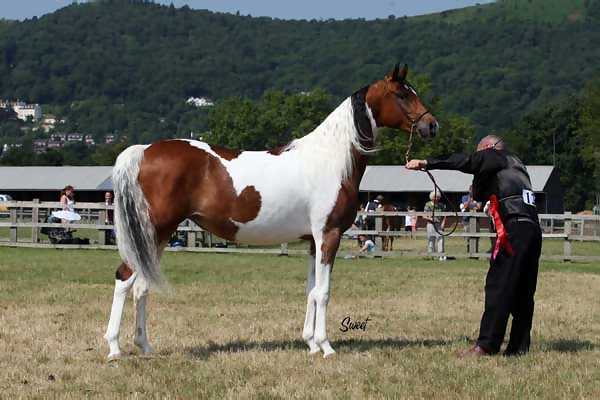 They have had breed status in the USA since 1992 and must carry over 99% of pure arab blood with the tobiano coat pattern. There are only about 600 registered to date and only a few have been exported out of the States. We are proud to be the first to import two young mares into the UK. Please check out our pintabian section in this web site to see more photos and view our first foal born 14.1.07, also our new stallion Jester arriving September 2007. 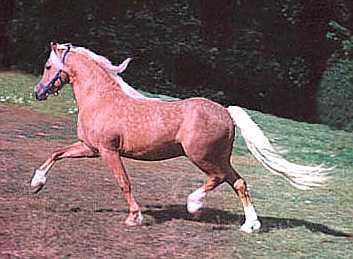 Pintabian stallion born 2003, he carries 99.8% pure arabian blood. Taken by Sweet Photography at Midlands Arabian festival. With our Pintabians and Welsh Cobs we are trying to breed colour without compromising on the quality and type that you'd expect from these graceful animals. This is just a brief outline of our studs history and I hope you enjoy browsing the rest of the web site, please don't forget to sign our guest book when you leave. If you would like to contact us for further info on anything please do.